Simply download, print or email your selected prequalified WPS's for use right away! It includes a variety of Filler Metals such as Carbon Steel Electrodes/Wires/Wire-Flux, Mild Steel Electrodes/Wires/Wire-Flux, Low Alloy Steel Electrodes/Wires, and Austenitic Stainless Steel Electrodes/Wires "as shown in Library"
We are committed to providing support to the welding industry, as well as helping improve the welding knowledge of students and the public. best he had ever seen! This is a fantastic service. I have been able to write many welding procedures in just the time it used to take me to do the research only. The greatest feature for me is being able to save my work online and then being able to go back to it later and edit it before I make the final save for our procedures book. Your welding software simplifies procedure writing for many of the welding codes, plus it's useful way of networking with members. Thank you for using the online welding software and welder software services for your day-to-day business in structural steel or welding manufacturing. Software upgrades and code updates at no extra charges! Save time and money, guaranteed! 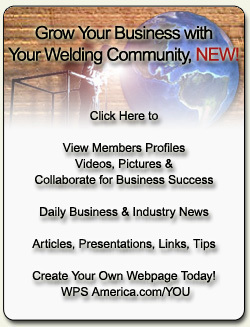 Welding community is a free value-added service for members of WPSAmerica.com. Our way to show appreciation to all members for their support. Thank You! Access to free online resources, publications, links and much more! Prequalified welding procedures can be used on work covered by the world's best references for structural steel welding, as well as in general fabrication work. Members include certified fabricators with the AWS, ASME, AISC, IBC, API and ISO, plus independent manufacturers, Fortune 500 companies, NASA, fabricators worldwide, professionals, welding engineers, structural or mechanical engineers, welders, welding technicians, certified welding inspectors (CWI), certified welding supervisors (CWS), certified welding educators (CWE), welding educators and students.